F.1 Can the CANDU reactor be used to burn weapons-grade Plutonium (as MOX)? F.2 Did India use a CANDU reactor in the 1970's to make an atomic bomb? F.3 What is the relevance of Canadian technology to India's recent nuclear weapons tests? F.4 How easily can an atomic bomb be made with spent CANDU fuel? F.5 Can uranium from dismantled warheads be used as fuel in power reactors? F.6 How are nuclear plants protected from terrorist attacks? F.7 How are CANDU reactors safeguarded against nuclear weapons proliferation? F.8 Why does Canada import Highly Enriched Uranium (HEU)? International non-proliferation agreements have identified large quantities of surplus weapons-grade uranium and plutonium in both the U.S. and Russia. 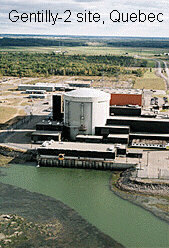 This FAQ addresses the issue of surplus plutonium; a separate FAQ deals with the uranium issue. A key 1994 report  by the U.S. National Academy of Sciences described the surplus-plutonium situation as a "clear and present danger to national and international security". The surplus plutonium must therefore be managed responsibly, and one attractive option is to "burn" the plutonium as fuel in a nuclear reactor (mixed with conventional uranium-dioxide fuel - a product known as "Mixed Oxide", or MOX, fuel). Weapons-grade plutonium is quite different from the type of plutonium created in a nuclear power reactor, but is still usable as fuel in a nuclear power reactor. In fact, power reactors are no strangers to plutonium fuel. Plutonium is a natural byproduct of the fission process, created by neutron capture in the uranium-238 nucleus. In a CANDU reactor enough plutonium is created in this manner to provide about half of the total energy produced. Under these circumstances, the plutonium in the fuel is called "reactor-grade", and while being inefficient as a bomb material, is quite suitable as power-reactor fuel (see related FAQ). In this manner, nuclear reactors actually "create" fuel from their own waste products, during routine operation. The suggestion comes naturally, therefore, that power reactors might be used to process surplus weapons-grade plutonium as well. This strategy formed one half of a two-track approach announced by the U.S. government in December 1996, as its plan for dealing with surplus weapons plutonium (see "Latest News" below for current status). The other strategy was to immobilize the plutonium in a glassified ("vitrified") mixture of spent fuel, and then bury it. This two-track approach was in accordance with the recommendations of the U.S. National Academy of Sciences study, which were subsequently accepted by the U.S. Department of Energy. Both strategies convert the weapons plutonium to the "spent fuel standard" (i.e. they reduce the accessibility to the same level as that of spent reactor fuel), and neither strategy is perfect. However, burning plutonium in power reactors has the advantages of (1) creating a useful by-product (electricity), (2) destroying a significant portion of the plutonium (over half of the fissile isotopes), and (3) changing the isotopic mixture of the plutonium so that it is much less attractive as a material for weapons  (vitrification, in comparison, retains the military plutonium's original isotopic mixture and mass). Opponents of the power-reactor strategy claimed that it would open the door to widespread adoption of MOX fuel cycles in power reactors (which they also oppose), and they point to safety and security concerns associated with transport and handling [3,4,5]. Supporters of the two-track approach pointed to the advantages of a diversified strategy, as well as the inherent advantages of the power-reactor option mentioned above . Canada has power reactors that are appropriate for the disposition of weapons-grade plutonium. The CANDU reactor, in fact, is the most efficient reactor type for this use since it achieves the highest disposition rate (through on-line fuel-shuffling), its control system can handle the kinetics of MOX fuel, and it requires little modification. See further discussion in Reference . In the proposals under consideration, the weapons-grade metallic plutonium would have been converted to an oxide powder, mixed (diluted, at 2 to 3%) with depleted-uranium oxide reactor fuel, and manufactured into CANDU fuel bundles in the country of origin. The plutonium would only have been shipped across Canadian borders in this diluted and chemically-altered form, packaged within pre-engineered CANDU fuel. In this form it would already be more resistant to proliferation, but further denaturing in a power reactor would have further reduced the proliferation risk. The fuel not only then becomes highly radioactive in this process, but the isotopic mixture of plutonium itself is also reduced to something resembling reactor-grade purity. There were further, political, attractions of the "CANDU MOX option". It provides third-party intervention in the disposition process: Both Russia and the U.S. could conceivably have seen Canada as a neutral location where their surplus plutonium will be treated. Russia also favoured the MOX approach over vitrification/immobilization , but possibly lacked the domestic ability to "burn" weapons-plutonium MOX fuel at appropriate rate. "The current-reactor/spent-fuel and vitrification-with-wastes options are the two leading contenders for plutonium disposition to the spent fuel standard. Because it is crucial that at least one of these options succeed, because time is of the essence, and because the costs of pursuing both in parallel are modest in relation to the security stakes, the panel recommends that project-oriented activities be initiated on both options, in parallel, at once." [NAS Committee on International Security and Arms Control, in CISAC-2, July 1995, p. 14). As part of this preparatory work, analysis was required to assess the feasibility of the off-shore CANDU-MOX fabrication process. In 2000 AECL began irradiation-testing of MOX fuel fabricated in both the U.S.A. and Russia, using the CANDU-environment simulation capabilities of the NRU research reactor (the experiment was called Parallex). AECL has many years of experience with MOX-fuel irradiation; these tests differed from this experience only in the source and isotopic makeup of the plutonium. January, 2002: The US DOE announced its decision to forego the vitrification option at this time, and only pursue the MOX strategy. This saved approximately $2 billion. The total cost of the disposition program at that time was estimated at almost $4 billion. June 2001: Canada announced its decision to support Russia's MOX disposition efforts to the tune of $30 million. The total cost of that program is estimated at $2 billion. Canadian MOX Experiments: AECL took delivery of the U.S. MOX sample for the Parallex test on January 14, 2000, and the Russian MOX sample on September 25, 2000. The multi-year Parallex test is currently being conducted, as planned, using the NRU research reactor at Chalk River Laboratories. May 2006: With progress slow in both the U.S. and Russia on the MOX disposition program, the U.S. takes measures to terminate its program. Lawrence Livermore National Laboratory published an information sheet on their development of "front-end" technology to service both disposition options. "The Committee recommends that the Government reject the idea of burning MOX fuel in Canada because this option is totally unfeasible, but that it continue to work with other governments to address the problem of surplus fissile material." "The Government does not endorse this recommendation. The SCFAIT report calls for Canada to "work consistently to reduce the political legitimacy and value of nuclear weapons in order to contribute to the goal of their progressive reduction and eventual elimination". As the CANDU MOX option is viewed internationally as a feasible option and could make a valuable contribution to the disposition of weapons plutonium, thereby promoting continued dismantling of nuclear weapons, the Canadian Government's agreement in principle to consider a CANDU MOX option reflects a responsible Canadian position to meet the goals stated by the SCFAIT report. "The Government does not consider there are sufficient grounds to justify abandoning the possibility of using MOX fuel in Canadian reactors as a means to reduce proliferation risks from weapons plutonium being declared surplus to defense needs in the USA and Russia. "Any use of such MOX fuel in Canadian reactors would require appropriate availability of end-use facilities and would be subject to all requirements of federal and provincial legislation and regulations, including the Canadian Environmental Assessment Act, the Transport of Dangerous Goods Act and the Atomic Energy Control Act. The technical feasibility of both the fabrication of CANDU fuel bundles made from a mixed oxide (MOX) fuel, approximately 3% weapons plutonium oxide mixed with depleted uranium oxide, and of their use in Canadian reactors has been studied jointly by Canadian, American and Russian experts. There are no technical, health or safety problems foreseen with this concept, based on the extensive domestic and international expertise with the technologies involved and the 20 years of Western European practical experience with MOX fuel using reactor grade plutonium, produced by reprocessing spent fuel from civilian reactors. "The Government agrees that Canada should continue to work with other governments to address the problem of surplus fissile material. In fact, Canada has encouraged a strong multilateral approach to determine the most expeditious and economic arrangements to deal with this issue. It is anticipated that the USA and Russia, along with the G7 and other countries, will establish in the near future an integrated program to expedite early resolution of this matter. "A Fissile Material Cut-off Treaty (FMCT) that would put an end for all time to the production of fissile material for nuclear weapons is another important international objective that Canada supports as a means of preventing further accumulation of fissile material while steps are taken to address the issue of excess fissile material in current stockpiles." "Plutonium: The Disposal Decision", Bulletin of the Atomic Scientists, March/April 1997, p. 40. E.S. Lyman and P. Leventhal, "Bury the Stuff", ibid, p. 45. F. Griffiths, "MOX Experience: The Disposition of Excess Russian and U.S. Weapons Plutonium in Canada", available on the CCNR website, July 1997. P. Gizewski, "The CANDU MOX Initiative: Report on a Stakeholders' Debate", Canadian Centre for Foreign Policy Development, July 1997. National Academy of Sciences, Committee on International Security and Arms Control, "Management and Disposition of Excess Weapons Plutonium", National Academy Press, Washington, DC, 1994. (See also response by A. DeVolpi, Physics and Society, July 1994). Tariq Rauf and Joanne Charnetski, "Swords into Ploughshares: Electricity from Surplus Weapons Plutonium Burn-Up in Canadian 'CANDU' Reactors", Center for Nonproliferation Studies, Monterey Institute for International Studies. This is a prevalent misconception. The issue is a 1974 atomic test explosion by India, which led to an immediate severance of international cooperation in India's nuclear technological development that exists to this day, except for maintenance and operational issues related to safety. Similar sanctions were placed on Pakistan as well. The plutonium used in this explosion was manufactured in a small research reactor near Bombay, India, which Canada supplied as part of a larger "technology-transfer" program in the late 50's, early 60's. The Indian research reactor, CIRUS, was based on Canada's NRX design, a heavy-water-moderated, light-water-cooled research reactor commissioned in 1947 at AECL Chalk River Laboratories (2 hours west of Ottawa). The main role of the NRX, which was decommissioned in the late 1980's, centred around materials testing, solid-state physics research, and isotope production, although it initially served as a prototype heavy-water plutonium production reactor, conceived during the days of the WWII Manhattan Project under a tripartite agreement between Canada, the U.S., and Britain (see related FAQ, also "Early Years of Nuclear Energy Research in Canada" by Dr. G.C. Laurence, and the author's article, "Entering the Nuclear Age", published in Legion Magazine). Heavy water for the Indian CIRUS reactor was provided by the United States; hence the "US" in the title (the original name for the reactor was simply "CIR", for "Canada-India Reactor"; in Bothwell's 1988 history of AECL, "Nucleus", the name "CIRUS" is also linked to Cyrus, shah of ancient Persia, as well as the name "Canada India Reactor Uranium System"). As an issue affecting CANDU reactors, the matter is irrelevant. The technology for producing electricity with a CANDU reactor is highly incompatible with the production of weapons-grade plutonium (see related FAQ). However, because of the highly technical differences between research reactors and power reactors, along with the regrettable fact that the Indian affair is linked to Canadian technology, the incident has caused some confusion. A webpage on Canada's nuclear history, maintained by Morgan Brown, can be found on the website of the Canadian Nuclear Society. On May 11 and 13, 1998, India shocked the world by conducting five underground nuclear test explosions. India was known to have nuclear weapons capability (see previous FAQ), but both the boldness of its 1998 tests (in a climate of global reduction in nuclear arsenals and tests), and the sophistication of the tests (including thermonuclear technology), took international observers by surprise. Pakistan followed shortly afterwards with nuclear test explosions of its own. The Indian tests have two possible links to Canadian-supplied technology: (1) some of the plutonium used may have been generated in the CIRUS research reactor supplied jointly by Canada and the USA about thirty years earlier (see previous FAQ); and (2) some of the tritium used in the development and implementation of India's thermonuclear devices may have been extracted as a by-product from the heavy-water moderator of India's pressurized-heavy-water power reactors based on Canadian CANDU technology . It is also possible that India used some of its unsafeguarded "CANDU-derivative" reactors (the copies of its two CANDU reactors, but unlike the CANDU units, not covered by UN-based safeguards) to generate weapons-grade plutonium . However, much of this information remains unconfirmed, and subject to speculation by outside observers. It is known that India has had, for many years, the technology for generating tritium in the same fashion as the other nuclear-weapons states: the irradiation of lithium-6 rods in reactors . The nuclear reaction behind this technology is many thousands of times more efficient than that which creates tritium as a by-product in heavy-water moderators. While a comparatively inefficient technique for tritium production, the extraction of tritium from heavy-water moderators – a process India developed without Canadian aid – is advantageous from the point of view of reducing both employee exposure, and the potential risk from accidental releases. This is as much a motive for its implementation in India as it was in Canada, where Ontario Hydro (now known as Ontario Power Generation Inc.) built a dedicated facility for tritium extraction at its Darlington nuclear plant near Toronto, Ontario (see related FAQ). While tritium is used in small amounts in "fusion-boosted" fission weapons (including boosted fission "triggers" of fusion weapons), and is important in the development of fusion weapons, it is usually not supplied externally as a major explosive component in deliverable thermonuclear weapons ("H-bombs"), mainly because of its short half life, and the necessity for cryogenic equipment to achieve the required density. Instead, the practice among the nuclear-weapons states is to employ a small amount of lithium-deuteride, a solid which transforms to a high-density mixture of deuterium and tritium (the two main components of a fusion reaction) under neutron bombardment at the moment of detonation. A militarily significant thermonuclear weapon would likely adopt this concept, and India would have had to develop this technology indigenously (or at least without Canadian aid). The Canadian/US-supplied 40 MW CIRUS research reactor is theoretically capable of producing up to 10 kg of weapons plutonium per year, although it is currently shut down for repairs and rehabilitation. India's other plutonium-production reactor, the 100 MW Dhruva facility, can produce two to three times the annual amount of weapons plutonium, and is an indigenously-designed reactor built for this purpose. While in theory plutonium of any purity can be generated in the fuel of any power or research reactor, from any global supplier, the crucial link to weapons proliferation is the technology to extract this plutonium, entailing the "reprocessing" of spent fuel in a highly complex series of dissolution and chemical extraction steps, and this is a technology that India developed indigenously. Furthermore, UN-based safeguards are in place to monitor the fuel usage in the two Indian CANDU reactors, and Canadian officials are convinced, based upon recent inspections, that no spent fuel was diverted from either of these two units. India's fleet of indigenously-built "CANDU-derivatives" is not covered by such safeguards however. T.S. Gopi Rethinaraj, "Tritium Breakthrough Brings India Closer to an H-Bomb Arsenal", Jane's Intelligence Review, January 1998. M. Hibbs, "India Made About 25 Cores for Nuclear Weapons Stockpile", Nucleonics Week, June 11, 1998, p.15. J. Stackhouse, "How the nuclear ban bent for India", The Globe and Mail, June 15, 1998. D. Albright, "The shots heard 'round the world", The Bulletin of the Atomic Scientists, July/August 1998. R. Silver and M. Hibbs, "Opponents Say South Asian Tests Show All CANDU Exports Should End", Nucleonics Week, June 25, 1998. An atomic bomb has never been manufactured using spent fuel from a CANDU reactor (see the two previous FAQs for more on the misconception that India may have done exactly this). The next point to be made is that it is not technically impossible, given sufficient ingenuity, expertise, expense, personal health risk, and luck, to make an explosive device from the plutonium present in spent CANDU reactor fuel (or any spent power-reactor fuel). However, since terrorist organizations may indeed meet the preceding criteria, the relevant question, and the subject of this FAQ, is "how easily" could this be accomplished? The issue of nuclear weapons proliferation, involving any form and purity of fissile material, is an important concern. It is important that we understand it, and neither underestimate nor overestimate the risks. To commit the former invites obvious consequences; to commit the latter can be equally catastrophic: anti-proliferation resources can be diverted to less worthy (i.e. lower risk) targets, and related infrastructures (e.g. civilian nuclear power) can be degraded or disassembled for illegitimate reasons. First, what makes the plutonium in spent fuel different from the plutonium in atomic bombs? The answer relates to the isotopic mixture of the plutonium. Weapons-grade plutonium, the kind used by all nuclear-weapons states in their fission and fusion plutonium bombs, contains at least 93% pure Pu-239, with the remainder a mix of other (mostly heavier) plutonium isotopes such as Pu-238, Pu-240, Pu-241, and Pu-242. Some of these other isotopes, while able to sustain a fission chain reaction, are spontaneous neutron emitters. Their presence in the warhead of an atomic bomb, therefore, raises the probability of pre-initiation or predetonation. This is what happens if the chain reaction initiates before it is supposed to (by even one stray neutron), leading to a much reduced explosive yield. In a nuclear weapon, the nominal yield is achieved by waiting until maximum reactivity is inserted, when neutron-multiplication is most efficient (for example, by applying maximum compression to a plutonium core), and then introducing a free neutron to initiate a divergent chain reaction. With plutonium of any isotopic mixture, there is a certain probability that a stray neutron will appear on the scene prior to this crucial point, starting the chain reaction prematurely and leading to a less-than-nominal yield. The minimum yield (excluding the possibility of a complete "dud") is that achieved by introducing a neutron at the earliest effective time (the point of criticality). The minimum yield is also referred to as the fizzle yield, possibly a few percent of the nominal yield . In reactor-grade plutonium, the kind produced as a by-product of fission in power reactors, the fraction of Pu-239 is typically 60-70%1, and therefore the chance of a predetonation would be greater if it were to be used in a nuclear weapon. In any reactor core, plutonium is manufactured when U-238, which constitutes over 99% of natural uranium, absorbs a neutron, and eventually decays into Pu-239. The amount of Pu-239 builds up as the fuel remains in the reactor, but at the same time more and more undesirable plutonium isotopes are created through subsequent neutron absorption and decay. In a weapons-grade plutonium-production reactor, therefore, the "trick" is to leave the fuel in long enough to create reasonable amounts of Pu-239, but not long enough to exceed the 7% limit on other plutonium isotopes. These reactors typically shuffle fuel so fast through their core that economical electricity generation is simply out of the question. the heat generated by radioactive decay (about 11 Watts/kg for spent LWR fuel  – almost 100 Watts for a critical mass) would melt the high-explosive material needed to compress the critical mass prior to initiation. With ingenuity both these problems are solvable, but they add to the difficulties (including time and cost), as well as personal health risk, associated with such an endeavour. The crucial difference is enough for nuclear-state nations to raise the Pu-239 fraction in weapons plutonium to over 93%. Safeguards are one aspect of a general consideration of the proliferation risk of reactor-grade plutonium. One must also be concerned with the details of acquisition, manufacturing, tactical and strategic usefulness on both a national and subnational level, as well as technical viability. Although this document will deal mainly with the latter issue – technical viability – it will touch on the "grander" issue of proliferation risk as well. Suppose for the moment, however, that someone were able to steal or divert enough spent fuel to make a critical mass with the enclosed reactor-grade plutonium. At approximately 80 g of plutonium per discharged CANDU fuel bundle , and assuming a reactor-grade critical mass (with effective neutron reflection) of 8 kg , this would require 100 spent fuel bundles, weighing two tonnes without shielding. Not only would the theft be extremely difficult, but since it would also be easily and quickly detected, it would be followed by the necessary evasion of a top-priority manhunt employing most likely the full resources of the country's security infrastructure. Suppose further that this person were then able to separate the plutonium from the rest of the spent fuel, requiring remote tooling because of the radioactivity of the fuel. What then, would the explosive yield from such plutonium be? Understandably, this topic sits squarely at the boundary of classified and declassified military knowledge. A public analysis must necessarily rely upon declassified information, including declassified statements made by nuclear weapons experts. As one such expert  reassures, "that is not to say, however, that relevant information that is considered classified cannot be derived from unclassified sources by competent people." In the last twenty-five years many authors have addressed the issue of reactor-grade bomb potential in the public literature, and while they usually assume a typical discharge plutonium assay from LWR reactors, the assay from CANDU reactors will not be different enough to change the general results, which are approximate anyway. Although most authors generally agree on the probable upper limit of explosive yield from reactor-grade plutonium, there is wide variation in the predictions of the average yield. The reason for this variation is that the calculation is highly non-trivial. Only one of the many relevant inputs to the analysis is the yield distribution of a predetonation, which several authors [2,3,4] have attempted to characterize (and some degree of "public" validation can be achieved by comparison with declassified statements made by Oppenheimer and Groves after the 1945 Trinity test [3,4]). There are many other parameters to take into account [4,5], including the critical mass required, the metallic phase (and change of phase) of the plutonium, the degree of radial compression achievable, the effect of subcritical multiplication (sometimes overlooked by weapons experts because it plays no significant role in "weapons-grade" bomb design), the maximum reactivity insertion achieved, and the surface leakage of neutrons. The easiest approach is to assume the "worst-case" scenario, i.e. that maximum success is achieved in all areas in the above list; this approach is non-informative, however, beyond indicating what the maximum achievable yield might be. The fact remains that making a nuclear bomb is not an easy task, despite the popular perception that the essential knowledge and capability is widespread in the post-Hiroshima world. While the fundamental concepts are widely appreciated, the task remains an enormously complex and expensive undertaking. Most authors agree that the complexity is increased significantly by adding the ingredient of reactor-grade plutonium. "If the assembly velocities ... are quite low, the earliest possible preinitiation could lead to an energy release (equivalent weight of high explosive) not many times larger than the weight of the device. If the velocities are quite high ... the lowest preinitiation yield may still be in the 100 tons range, even in a crude design." Mark expands upon this point elsewhere , describing the fizzle-yield as "a few percent" of the nominal yield, which, for a Trinity/Nagasaki style device with a nominal yield in the tens of kilotons, puts the fizzle-yield in the hundreds of tons. Mark's work is particularly indicative of the interesting classified/declassified nature of this topic: he was Director of the Theoretical Division at Los Alamos from 1947 to 1972, and yet bases all of his crucial probability calculations – necessarily – on recently-declassified comments made by Oppenheimer and Groves in letters written in 1945. There are those that predict lower values: Sahin  puts the upper limit at 100 tons for typical reactor-grade plutonium; Miettinen  reports predictions of attainable yields less than one kiloton. There are also those that predict higher values: a study  by the US National Academy of Sciences (NAS) refers to an "assured" yield for a "relatively simple" device of the order of "one or a few kilotons". This claim is noteworthy because it implies guaranteed kiloton-range yields; however, some clarification is supplied by Dr. William Sutcliffe , one of the authors of the restricted LLNL report  referenced by the NAS authors. Dr. Sutcliffe is necessarily general in his response, but makes it clear that yields of all ranges are possible (even zero), and he doesn't believe that the NAS authors were making a general statement about "all" forms of reactor-grade weapons. Meyer's work  is useful in sorting out the ambiguity because he reports a range of results depending on the target reactivity insertion (related to the level of sophistication) of the bomb design. The higher the target reactivity insertion, the greater the nominal yield of the device, but also the greater the probability of predetonation that must be overcome. As a sort of "median" result, it may be inferred from Meyer's analysis that a device with 50% chance of predetonating, would produce a nominal yield of around one kiloton. Note that this value corresponds to that used in the NAS statement, but it is far from "assured" according to Meyer. A thorough treatment is found in DeVolpi's 1979 seminal book on the subject , elements of which appear elsewhere [18,23]. DeVolpi attempts a quantitative assessment based upon the many factors listed earlier (predetonation probability, critical mass, metallic phase, radial compression, subcritical multiplication, reactivity insertion, and surface leakage), pulls all the contributing probabilities together, and sorts them according to three levels of "sophistication". He predicts average yields, from reactor-grade bombs, over a range from 10 tons to 10 kilotons, in order from lowest sophistication to highest. DeVolpi's predicted average yield does not go above 1 kT until a sophistication level appropriate for a national program is reached, and the highest level corresponds to a nuclear-weapons state development program. He also points out that many "conventional" weapons designers tend to overlook the issue of subcritical multiplication because it is irrelevant to designs with weapons-grade plutonium. This one factor alone can amplify the predetonation neutron field by factor of ten. DeVolpi's work was supported by the late Hans Bethe, Director of the Theoretical Division at Los Alamos during the war and a notable nuclear weapons expert. It also has its critics, notably Amory Lovins [4,22], who claims that achievable reactivity insertions are sufficient to reduce the distinction between denatured forms of plutonium, in terms of probable yield. DeVolpi counters that Lovins' insertion rates are 10 to 100 times greater than rates derived from the unclassified literature, and that, if true, Lovins' claims imply that militarily useful weapons can also be made with low fissile fractions of U-235 as well. This contradicts experience, and the opinion of experts like Bethe. In a more recent article , Lovins repeats the claims, but also points out that the unreliability of "unsophisticated designs" is not a deterrent, since it matters not "whether the designer can accurately predict the yield, but rather that the intended victims cannot." All this may appear academic in light of the fact that a one-kiloton bomb, or even a one-hundred-ton bomb, is a potentially destructive weapon in its own right . This is especially true when you consider that a bomb of several hundred tons yield may be used to ignite a thermonuclear "booster"  and achieve much higher yields (although the most "crude" of the predicted reactor-grade devices are probably too weak to be used this way ). It is important, therefore, to consider mitigating factors such as complexity, expense, acquisition, and consequently the level of sophistication required, which are not translated in simple statements addressing only the issue of possible yield. In all likelihood, it is impossible to evaluate the true proliferation risk of reactor-grade plutonium without addressing these concomitant factors. "The isotopic mix of typical LWR spent fuel is generally considered to be proliferation resistant due to its low concentration of Pu-239 (~56 wt%) and higher concentration of Pu-240 (~23 wt%), Pu-241 (~14 wt%), and Pu-238 (~1 wt%) – all of which increase the level of difficulty required to design and fabricate and effective weapon. The level of difficulty increases due to the internal heating caused by alpha decay from Pu-238; the additional neutron source rate due to spontaneous fissions from Pu-240, which increases the likelihood for a weapon to pre-initiate; and the highly penetrating gamma rays from Am-241, which arise from the decay of Pu-241 increasing the handling and fabrication difficulties of LWR plutonium. [...] Thus, for these reasons, LWR-like isotopic mixes of plutonium do incrementally increase the proliferation resistance of the material by increasing he level of difficulty in designing and fabricating the weapon." The Los Alamos report then stresses that this increased proliferation resistance of reactor-grade vs. weapons-grade plutonium should not be used as a discriminating factor in the definition of conservative weapons-proliferation-resistance policy, since reactor-grade plutonium can still be used in a nuclear weapon (with a "likely fizzle yield" estimated as "several kilo-tonnes"). Consider, for the sake of illustrative argument, representatives of the two ends of the scale of "sophistication", each with a motive to pursue reactor-grade weapons: at one end is a terrorist group; at the other is a national defence program. The terrorist group, without a national-level development program, is probably limited to the kiloton range as the average result of their efforts, with a certain probability of achieving less than this. If they desire higher yields, or more reliability of kiloton yields, they need to develop methods to shorten the compression times, increase the degree of compression, or accelerate the fission chain reaction, all of which necessarily adds to the complexity, expense, and time-scale of their undertaking. At the same time, they will have to deal with the problems of radiation exposure and self-heating in the plutonium core. The latter is especially important in the application of the device since the heat generated by reactor-grade plutonium is enough to melt the high explosive normally packed around the core as a detonator. Both the radiation and heating problems, like that of average yield, are in theory solvable, but certainly daunting in comparison with more conventional weapons that can deliver equivalent results. Even if the group must simultaneously detonate several "Oklahoma City"-style bombs (an example of what are colloquially referred to as "blockbusters") to achieve the same mass destruction as one reactor-grade plutonium weapon, this is more than compensated by the ease of acquiring the ingredients (fertilizer and diesel fuel), the conventional and reliable nature of the detonation, and the easily masked process of manufacturing and delivery. The national-level defence program, on the other hand, can assign its best minds to the task and solve the problems of unreliable low yield, radiation field, and heat generation. In the end they might attain a more reliable, multi-kiloton weapon, or even a primary to a multi-stage fusion weapon. How much incentive is there to pursue this route, however, when (a) the inherent complexity remains greater than that of the weapons-plutonium or weapons-uranium route, and (b) the size and weight of the device would still compromise its military usefulness? Why waste defence resources solving problems of heat generation and predetonation probability, with higher critical mass and higher radiation fields, when you can avoid the issues in the same manner they did in 1945? Even if you possess spent power reactor fuel in storage, is the expense and complexity less than that associated with a weapons-plutonium or uranium-enrichment route? Furthermore, if you are a signatory to international safeguards, would you risk detection in so obvious a manner when other options can be pursued in smaller, cheaper, even indigenously-designed (and therefore unsafeguarded) facilities ? The answers to these questions are not readily apparent, but surely there is validity enough in the above two scenarios to render the proliferation risk of reactor-grade plutonium lower than that based upon technical viability alone. Certainly it is known that nuclear-weapons states themselves have little use for reactor grade plutonium; for example, the US weapons program has considered a program to isotopically enrich reactor-grade plutonium in spent power reactor fuel, which indicates its lack of faith in the military utility of the un-enriched, reactor-grade product. The U.S. government has also offered to help pay for the conversion of Russia's "dual-use" plutonium production reactors to solely civilian use, a move based on the recognition of civilian plutonium's low military utility . John Holdren, chairman of the Committee on International Security and Arms Control (CISAC) of the US National Academy of Sciences (NAS), a body that recommended the "burning" of surplus weapons-grade plutonium in power reactors as one strategy for reducing its proliferation risk (see related FAQ), points to the difficulty that even nuclear-weapons states would encounter in trying to make a weapon with the resulting reactor-grade plutonium, as one rationale behind the Committee's conclusions . In late 2000 CISAC published an update  on its surplus weapons plutonium recommendations, declaring plutonium isotopic content to be of "moderate" importance as a proliferation barrier for both "host" and "proliferant" states. For "subnational groups" the report considers the matter to be of "low" importance, since groups in this category (e.g. terrorist organisations) would be less concerned about final bomb yield. "Contrary to opinions expressed by many nuclear engineers that are not familiar with the still secret intimate details of nuclear weapon design and operation, plutonium extracted from all types of spent fuel removed from nuclear power plants or research reactors can be used for making modern fission or thermonuclear weapons that are reliably predictable in performance, over a very wide range of yields, from fractions of a kiloton to megatons of high explosive equivalent. This has been true for decades, and confirmed by numerous nuclear weapons tests." This is a broad statement, and given that Taylor only specifies a range of yield, and not the corresponding levels of required sophistication, and also that his range includes "fractions of a kiloton", his statement is in agreement with other observers. However, Taylor, who specialized in lightweight, highly-sophisticated nuclear weapons during his time at Los Alamos in the 1950s, is presumably not referring to reactor-grade material in his last sentence. The only publicly known US test of a reactor-grade device was a 1962 explosion, partially declassified in 1977. However, in 1962 the term "reactor-grade" included any purity less than 93% Pu-239 . The plutonium for the 1962 test came from a British MAGNOX reactor (a dual-purpose electricity/plutonium-production design), and is suspected of being in the range 80-90% Pu-239, although this fact remains classified [14,15,16,33]. It must be emphasized that the existence of safeguards is implicit in the assumptions of proliferation risk presented here. It can be argued that people will build nuclear weapons whether nuclear power fuel is available or not, and people will generate nuclear power whether nuclear weapons are available or not. The overriding need is for international scrutiny and cooperation, in the form of an enforceable and effective safeguards regime. After assessing the realistic proliferation risk of nuclear power reactors, the next step is to balance this risk against the benefit of nuclear power reactors. There are environmental and economic arguments to be made, but an anti-proliferation argument also exists that deserves attention. Nuclear power has the promise to bring abundant energy supply to developing and less privileged nations. Since energy is a driving force behind economic development, it stands to reason that an increase in energy availability can be linked to an increase in standard of living. Surely this is a stabilizing sociopolitical influence with anti-proliferation consequences, and therefore this aspect must not be overlooked in rational assessments of the overall issue. Furthermore, through the current Non-Proliferation Treaty (NPT) regime, nuclear power is a "carrot" used to entice non-nuclear-weapons states to remain that way. If the proliferation risk of nuclear power were deemed sufficiently intolerable for it to be taken out of the equation, then such treaties, while perhaps not perfect, become moot. Nuclear reactors will continue to be built, but in an unsafeguarded environment. Perhaps the necessity for proper perspective is best illustrated by analogy with other industrial links to weapons of mass death and destruction. Most man-made destruction of life and property over the past century was inflicted with chemical explosives and chemical poisons, and yet global commerce in the chemical industry is allowed to flourish, despite a continuing (and, in the case of chemical poisons, escalating ) threat. Similarly, the biotechnology industry is not generally opposed on the grounds that its direct products are used as weapons of war and terrorism [25,26,29] (and even as a component of nuclear weapons proliferation ). Accelerators and lasers can be used to generate and enrich fissile material for use in nuclear weapons, while simultaneously contributing enormously to applications in engineering and health care. Finally, virtually all modern design and "testing" of nuclear weapons is performed in the digital world of supercomputers. India, in bringing itself to the self-declared point of thermonuclear statehood, relied at least as much on digital technology as it did on tritium and plutonium production technology. There is no inherent aspect to any of the technologies listed here that restricts it from being applied maliciously - the decision is sociopolitical. This range of plutonium isotopic variation in spent fuel is remarkably small, given the diverse reactor designs to which it applies. The total specific energy ("burnup") produced by CANDU fuel, for instance, can be four to six times less than that of LWR fuel, but due to CANDU's use of natural uranium and highly thermalized neutron spectrum, the relative abundance of higher plutonium isotopes ends up similar. A. DeVolpi, "The Physics and Policy of Plutonium Disposition", Physics and Society, Vol. 23, No. 3, http://www.aps.org/units/fps/newsletters/1994/july/ajul94.cfm#al, July 1994. W. Meyer et al, "The Homemade Nuclear Bomb Syndrome", Nuclear Safety, Vol. 18, No. 4, July-Aug. 1977. J. Carson Mark, "Explosive Properties of Reactor-Grade Plutonium", Science and Global Security, Vol. 4, 1993. A. DeVolpi, Proliferation, Plutonium and Policy – Institutional and Technological Impediments to Nuclear Weapons Propagation, Pergamon Press, 1979. S. Sahin, "Non-proliferation", letter to Nature, Vol. 287, 1980 October 16. J. Carson Mark, T. Taylor, et al., "Can Terrorists Build Nuclear Weapons? ", in P. Leventhal and Y. Alexander, eds., Preventing Nuclear Terrorism, Lexington Books, 1987. J.K. Miettinen, "Nuclear Miniweapons and Low-Yield Nuclear Weapons Which Use Reactor-Grade Plutonium: Their Effect on the Durability of the NPT", in Nuclear Proliferation Problems, Stockholm International Peace Research Institute (SIPRI), MIT Press, 1974. Management and Disposition of Excess Weapons Plutonium, Vol. 1 and 2, National Academy of Sciences (NAS), Committee on International Security and Arms Control, National Academy Press, Washington DC, 1994. W.G. Sutcliffe, personal communication, Lawrence Livermore National Laboratory (LLNL), June 1998. W. G. Sutcliffe and T.J. Trapp, eds., "Extraction and Utility of Reactor-Grade Plutonium for Weapons", Lawrence Livermore National Laboratory, UCRL-LR-115542, 1994 (S/RD). See discussion of small (tactical) fission weapons in "The High Energy Weapons Archive – A Guide to Nuclear Weapons", at the URL http://nuclearweaponarchive.org. R.W. Morrison, "Is Canada Peddling Nuclear Bombs World-Wide in the Guise of Nuclear Reactors? ", Science Forum, Vol. 10, No. 6, 1977. DOE Facts, "Additional Information Concerning Underground Nuclear Weapon Test of Reactor-grade Plutonium", Washington, D.C., http://apollo.osti.gov/html/osti/opennet/document/press/pc29.html, June 1994. A. DeVolpi, "A Cover-up of Nuclear Test Information? ", Physics and Society, Vol. 25, No. 4, http://www.aps.org/units/fps/newsletters/1996/october/aoct96.cfm#a2, October 1996. Nuclear Electricity, Seventh Edition, Uranium Information Centre, Melbourne, Australia, http://www.uic.com.au/ne7.htm, 2003. A. Lovins, "Plutonium Disposition", letters to Physics and Society, Vol. 23, No. 4, October 1994. A. DeVolpi, "Denaturing Fissile Materials", Progress in Nuclear Energy, Vol. 10, No. 2, 1982. T. Taylor, "Utility of Reactor Grade Plutonium in Nuclear Weapons", comment submitted to a debate on the internet listserver of the Canadian Network to Abolish Nuclear Weapons (CNANW), June 10, 1998. J. Holdren, "Work With Russia", Bulletin of the Atomic Scientists, March/April 1997, p. 40. A. Lovins, "Nuclear Weapons and Power-Reactor Plutonium", Nature, Vol. 283, 28 February 1980. A. DeVolpi, "Fissile Materials and Nuclear Weapons Proliferation", Annual Review of Nuclear and Particle Science, Vol. 36, 1986. F.J. Gaffney, Jr., "Making the World Safe for VX", Commentary Magazine, October 1998. E. Masood, "Bioweapons scientist says microbes can be made safer", Nature, Vol. 394, 23 July 1998. G. Achcar, "The Spectre of Bioterrorism", Le Monde Diplomatique, September 1998. A. Sen, "The Nuclear Bug", New Scientist, 11 July 1998. T. Perry, "Stemming Russia's Plutonium Tide: Cooperative Efforts to Convert Military Reactors", The Nonproliferation Review, Monterey Institute of International Studies, Center for Nonproliferation Studies, 4, 2, Winter 1997. R. Taylor, "All Fall Down (Bioterrorism Special Report)", New Scientist, 11 May 1996. T. Taylor, "Nuclear Safeguards", Ann. Rev. of Nucl. Sci., 25, 406, 1975. D.A. Close, B.L. Fearey, J.t. Markin, D.A. Rutherford, R.A. Duggan, C.D. Jaeger, D.L. Mangan, R.W. Moya, L.R. Moore, R.S. Strait, "Proliferation Resistance Criteria for Fissile Material Disposition", Los Alamos National Laboratory report, LA-12935-MS, April 1995. Committee on International Security and Arms Control, National Academy of Sciences, "The Spent-Fuel Standard for Disposition of Excess Weapon Plutonium: Application to Current DOE Options", National Academy Press, Washington, D.C., 2000. B. Pellaud, "Proliferation Aspects of Plutonium Recycling", Journal of Nuclear Materials Management, 31, 1, Fall 2002. Thousands of dismantled nuclear warheads on this planet, rendered inoperative in accordance with international treaties, can be viewed as potential sources of civilian nuclear reactor fuel. This is true whether the warheads were made with plutonium (treated separately in FAQ F.1), or uranium. There is a greater abundance of dismantled uranium warheads than plutonium warheads on the planet; however, unlike plutonium, weapons-grade uranium can be easily denatured to reactor-grade at its point of origin, and shipped internationally in this form. In this manner thousands of warheads from Russia have already been transformed into useful reactor fuel, through an agreement between that country and the United States. For further information see the World Nuclear Association briefing paper on this subject. Counter-terrorist measures have long been an important part of overall security at nuclear power stations. Following the suicide terrorist attacks in the U.S. on September 11, 2001, however, the public has become understandably concerned about all aspects of national security – particularly, that of perceived "high-risk" targets such as electrical grids and power plants, water treatment facilities, chemical plants, communication hubs, and transportation systems. 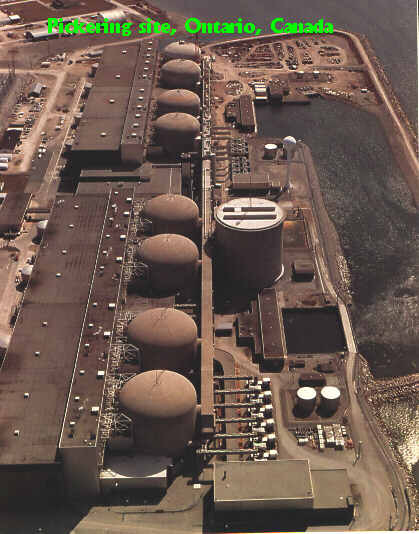 In response to the tragic events of September 2001, security was increased to maximum at nuclear facilities in North America and around the world. In Canada, the Canadian Nuclear Safety Commission (CNSC) ordered additional measures to increase security at all Canadian nuclear plants, following a review of two studies previously commissioned (in 1999 and 2000). See CNSC link below for more information. North-American-style commercial nuclear power plants (CANDU, PWR, BWR) are, by design, robust technologies against abnormal events initiated both internally and externally. Nuclear reactors are designed to rapidly shut themselves down at the slightest hint of trouble, without operator intervention (see related FAQ). All sensitive areas of a nuclear plant are protected behind layers of security and safety barriers, with redundant (backup) security and safety systems available should these fail. At the heart of this fortress is the reactor itself, and related safety equipment, enclosed within a heavy "containment" structure of concrete and steel, with side walls 3.5 to 6 feet in depth (depending on the design). Reactor containment does exactly what its name implies, under all credible normal and abnormal conditions. In addition to protecting the public from all credible internal incidents, these structures are qualified to withstand tornados, hurricanes, seismic activity, and impacts by airborne objects (including, in some U.S. cases, airplanes up to a certain size). The license requirements reflect the predicted frequency and scale of such events, and imply nothing about events "not included" in the list – they were simply not included in the safety analysis. Direct suicidal impacts by large, fully fuelled, commercial aircraft, such as those which destroyed New York's World Trade Centre (WTC), were not included in the safety analysis of nuclear plants or any other civilian structure on this planet. While it is easy to foresee significant local (on-site) destruction and loss of life resulting from such an attack on a nuclear station, the issue relevant to public safety is the potential for catastrophic damage to the reactor core itself, and consequent off-site radiation exposure. In the view of several studies since 2001 (see links below), catastrophic destruction following a WTC-style assault (i.e., complete structural penetration, followed by an explosion and aviation fuel fire), is not a likely scenario for Western-world nuclear plants. Even if a direct hit by a jumbo jet were achieved (a very difficult manoeuvre due to the low profile of these structures, unlike the WTC), the target is a highly robust object smaller than the plane itself – like driving a car into an office safe in order to break it open. Most of the energy would be absorbed by the destruction of the jet itself, and even if the containment structure were to weaken or crack, this response would absorb more energy and further protect the interior from the main force of the collision. In 1988 Sandia National Laboratories demonstrated the unequal distribution of energy absorption that occurs when an aircraft impacts a massive, hardened target. The test involved a rocket-propelled F4 Phantom jet and a heavy, essentially rigid slab of concrete (12-foot thickness). According to an Oct. 1995 article in Wired magazine, "the mother of all tests was the one involving an F4 Phantom jet: 35 rockets sent it hurtling into a concrete slab at 475 mph. This last experiment was to see whether a proposed Japanese nuclear power plant could withstand the impact of a crazed kamikaze-piloted aircraft; its spectacular result, according to laconic 35-year Sandia veteran Bill Kampfe, was 'pretty damn small pieces'." A modern 747 or 767 passenger jet is considerably bigger than an F4 Phantom fighter, but most of its bulk consists of lightweight, collapsible fuselage and wing material – comparable in robustness to (and therefore able to penetrate) the outer skin material of the WTC, but a poor match for the walls of a reactor containment building. In all likelihood, the only components of a large jet with enough inertia to pose a threat to reactor containment integrity are the engines. If true, this fact adds some relevance to the scale of the F4 Phantom tests at Sandia Labs. It also suggests a reduced sensitivity of airplane-impact safety analyses to the type of plane involved (e.g. older 707 jets vs. modern 747s and 767s), depending on the number of engines that can be realistically postulated to be involved in a direct collision, and the differences in engine mass. It should also be noted that reactor containments are not perfectly rigid structures like that approximated in the Sandia experiment; however, they are much more massive and rigid structures than any aircraft, guaranteeing a correspondingly high unequal distribution of collision energy. Within the outer containment building visible at most nuclear stations (e.g. the Gentilly-2, Pt. 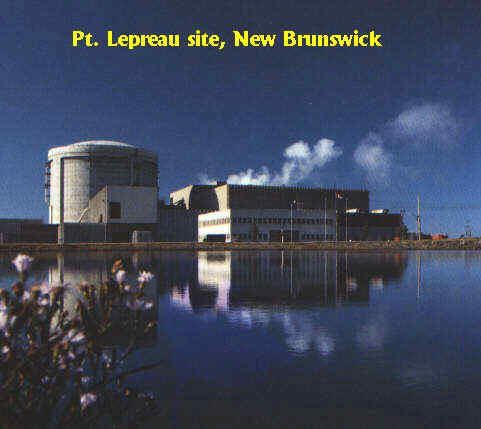 Lepreau, and Pickering CANDU plants in Canada) are further levels of heavy concrete enclosures (including a "reactor vault" surrounding the core itself, consisting of at minimum 4-foot-thick concrete walls in CANDU plants). Even in a containment breaching scenario there would be no nuclear explosion (impossible, even theoretically), and little chance of exposing nuclear fuel. Should the reactor be of CANDU design it is hard to envision fuel melting even if all the primary coolant were removed, due to the large heavy-water moderator that acts as an emergency heat sink (see related FAQ). The second, and more destructive, stage of the WTC tragedy was the total collapse of both structures – not from the shock of impact (although that would have weakened the structure), but from the resulting jet-fuel-fed fire within the buildings. The fire heated the thinly-insulated structural steel, which weakened and was no longer able to support the floors above. As floors collapsed, the floors below were unable to withstand the shock loading, and failed themselves. If an aircraft struck a reactor containment, the fire would remain on the outside of the thick containment walls, the concrete of which would act as thick insulation to protect the structural steel. The fire would also be free to burn upwards and away from the reactor building, reducing the heat transferred to the structure. In conclusion, while a WTC-style attack on a commercial North American nuclear station would likely result in a heavy loss of life and property at the plant site itself, plus damage to the electrical grid infrastructure and significant loss of generating capacity, it would have little effect outside the plant's exclusion boundary. If radiation were released the amounts would not be significant enough to make this an attractive terrorist target for a WTC-style attack. Since 2001, several analyses have confirmed this finding, including an extensive study released in 2002 by the EPRI (Electric Power Research Institute) - see a brief description of EPRI's methodology in this NEI news release reporting the preliminary results from June 2002. See also the the full report here on the NEI website. Studies prior to 2001 also support the finding, including an analysis of a direct 747 collision with a CANDU plant by Ontario Hydro (now Ontario Power Generation) in the 1980s, which predicted some spallation of concrete on the inner containment wall, but no penetration (decribed in a paper by the International Nuclear Energy Academy, INEA, found here). Postulated external attacks of various descriptions (including large aircraft crashes) have now become part of the design-basis safety analysis performed for many major infrastructure facilities, including nuclear power plants. For example, direct hit by a passenger aircraft is now included in the design-basis of AECL's new ACR-1000 design. "Frequently Asked Questions About Nuclear Security in Canada", Canadian Nuclear Safety Commission (CNSC). Article in The Globe and Mail, 2001 December 21: "Canada won't impose no-fly zones over reactors"
Preliminary results from an Electric Power Research Institute (EPRI) study showing that reactor containment buildings would likely withstand a 9/11-style terrorist attack. "Deterring Terrorism: Aircraft Crash Impact Analyses Demonstrate Nuclear Power Plant�s Structural Strength", Nuclear Energy Institute. "Assessing the risk of terrorist attacks on nuclear facilities", U.K. Parliamentary Office of Science and Technology (POST), Report 222, July 2004. "Nuclear Facilities and Terrorism", an INEA executive statement by Dave Rossin et al. A CANDU reactor, like all commerical power reactors, creates plutonium in its fuel which could be used in the manufacture of a nuclear device (albeit of limited usefulness - see related FAQ). Under the auspices of the International Atomic Energy Agency (IAEA), an agency of the United Nations, a number of safeguards are applied to CANDU reactors that meet the international convention of (a) timely detection of the diversion of nuclear material, and (b) deterrence of such diversion in the first place, due to the capability for timely detection. As with all commercial power reactors, these safeguards are based primarily on accountability of the fuel inventory at all stages of its movement (including within the reactor core), utilizing overlapping layers of "containment" (physical barriers) and "surveillance" (monitoring), backed up by periodic inspections. To date there has been no documented diversion of fuel from any CANDU reactor. While safeguards represent sufficient external measures to reduce the proliferation risk to an internationally-acceptable level, a number of inherent features are also found in CANDU technology that reduce the risk of proliferation. First and foremost, natural-uranium-fuelled CANDU reactors require no uranium enrichment capability by a host state, decoupling civilian power generation from one of the key technologies in the manufacture of nuclear weapons. Secondly, the significantly large mass of CANDU spent fuel required for the extraction of usable amounts of plutonium (weighing over two tonnes, without shielding), comprising of a large number of components (over a hundred fuel bundles), makes undetected diversion a non-trivial challenge. Thirdly, the relatively low concentration of plutonium in CANDU spent fuel (roughly half the already-low concentration in light-water spent fuel) reduces its proliferation attractiveness by adding to the scale and complexity of any subsequent extraction process. Finally, the on-power refuelling of a CANDU reactor is necessarily automated and therefore an easily monitored procedure, operating in conditions of intense heat and radiation, at a rate that cannot readily be increased. J.J. Whitlock, "CANDU: Setting the Standard for Proliferation Resistance of Generation III and III+ Reactors", International Conference on Opportunities and Challenges for Water Cooled Reactors in the 21st Century, Vienna, Austria, Oct. 27-30, 2009. Highly Enriched Uranium (HEU) is defined as any form of uranium where the fissile isotope, U-235, normally found at a concentration of about 0.7% in natural uranium, is enriched to a concentration greater than 20%. Typically, the HEU referenced in the context of some research reactors, medical isotope production, or the manufacture of nuclear weapons, is enriched to a U-235 concentration greater than 90% (often informally called "bomb-grade"). HEU, at concentrations greater than 90%, is the most efficient form of uranium for the nuclear fission process in any application, and for this reason it was utilized as the fuel of choice in research reactors developed around the world in the 1950s to the 1970s. Since the late 1970s, increasing international concern with the potential use of HEU as an explosive material in nuclear weapons has led to a global effort to reduce the amount of HEU in civilian use. This has led in Canada, and around the world, to the conversion of research reactors to operate on Low Enriched Uranium (LEU), typically enriched to a concentration of about 20% U-235. Currently two research reactors in Canada still operate on HEU (down from a total of 10 research reactors that have operated on HEU in Canada at some point since 1959). In addition, the manufacture of medical radioisotopes at the NRU reactor at AECL's Chalk River Laboratories involves the irradiation of HEU target material (the NRU reactor itself operates on LEU however). At all times during transportation and storage, in both the country of origin (the U.S.) and in Canada, HEU handling complies with strict regulations on safety and security. In addition, Canada is a strong supporter of the global non-proliferation regime and allows the International Atomic Energy Agency (IAEA) to place its inventory of HEU (and all other nuclear material) under international safeguards. "Highly Enriched Uranium in Canada", Fact Sheet, Canadian Nuclear Safety Commission, 2012. How many research reactors are operating in Canada? What is Canada's role in nuclear medicine and isotope production?